This Get Organized Checklist for Your Linen Closet will walk you through a simple process to whip your linen closet into shape. No more digging around for the matching pillowcase or wondering where all of the hand towels have disappeared to. This checklist is part of the Get Organized series. Each week I’ll be sharing a new checklist to help you organize one specific area of your home or life. Last week I shared my Get Organized Checklist for Your Taxes. This week, we’re recovering from last week’s paper cuts and tackling the linen closet. Holiday guests and children on break from school can wreak havoc on this small storage space. Thankfully, because it’s a small space, it doesn’t take long to get it in order. 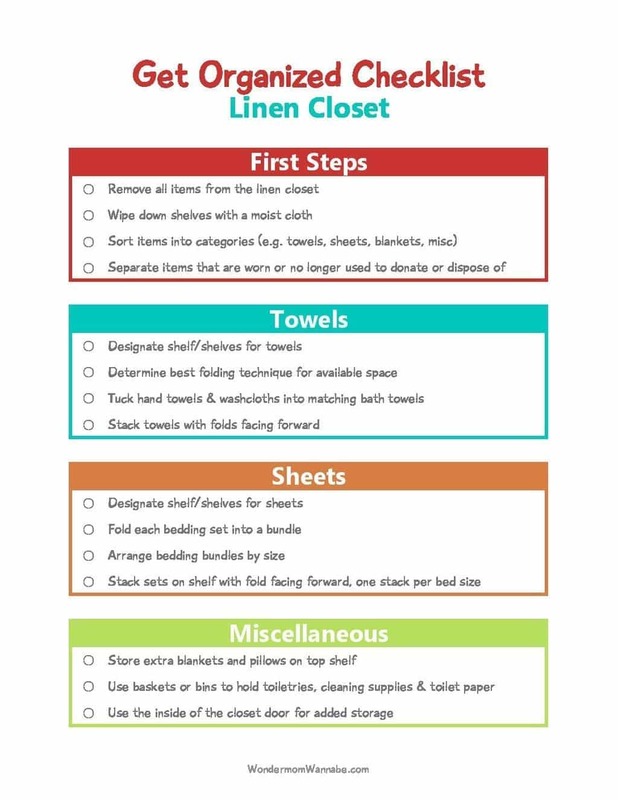 The Get Organized Checklist for Your Linen Closet walks you through the steps one-by-one. Before you can organize your linen closet, you need to do a few important things first. It’ll be easiest to organize the space if you start with a clean slate. So, before you do anything else, remove everything from the linen closet. Since you’re a busy parent, I’m going to assume you don’t have “clean the linen closet” in your weekly cleaning routine. While it’s empty, take this opportunity to wipe down all the shelves, vacuum the corners and floor, and clean out any dust bunnies or cobwebs. I like to sort out the products we no longer need AFTER I’ve sorted them into categories. If you remove items before the sort, you run the risk of throwing out too much or holding on to too many things you don’t need. For example, if you decide to get rid of all the towels that are no longer ultra thick and fluffy, you might end up with fewer towels than you need. In contrast, if you decide to only get rid of sheets that are soiled or torn, you might end up with multiple sets per bed, many of which won’t get used and will be taking up space in the closet for no reason. Linens are expensive so try to repurpose them as much as possible. Old towels can be used for drying cars, pets, or cleaning up spills. Old sheets are perfect for handing down to the kids to use to make indoor forts. If you just want those items out of your home, consider donating those in good condition to homeless shelters or organizations like Goodwill. Worn or damaged linens are almost always welcomed at animal shelters. Once you’ve sorted your items and gotten rid of those you no longer need, you’re ready to start putting items back in the closet. Since towels are the items that will likely be used the most, I like to start with those. First, look at how many towels you have and decide whether you need one or two shelves to contain them all. Also, make sure you choose a shelf or shelves that are easy to access since everyone in the family will need to be able to reach them. Next, consider the size of your shelves. Are they deep or shallow? Are they wide or narrow? You need to have a good understanding of the space you have available so you can choose the best folding technique. 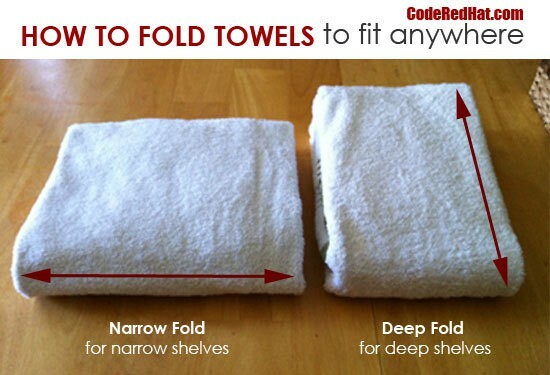 Code Red Hat has a wonderful post (complete with lots of detailed instructions and photos) on how to fold towels no matter what size and shape your storage space is. Rather than trying to create a space to store hand towels and washcloths, fold these items into a flat square or rectangle that you can set inside the matching bath towel before making the final fold. This keeps the sets together, making it easier to grab a full towel replacement for the bathroom. Plus, it keeps the linen closet looking tidy and organized. The secret to a clean look in your linen closet is to reduce the number of lines. If you stack your towels with the fold out, you eliminate multiple lines. Each towel set presents a rounded edge rather than a stack of edges. Along with towels, bedding takes up a large portion of our linen closets. These are also the linen closet items that tend to get the messiest first as family members dig through to find matching sets or pull sets out from the middle or bottom of a pile. This system will help slow down that cycle. Just like we did with the towels, the first step is to figure out how much space you will have to work with. Designate a shelf or two for your bed linens. The number one reason our linen closets start to get messy is because someone has to scavenge through the piles to find all the matching pieces to a set. Eliminate this problem by always folding the sets into a single bundle. 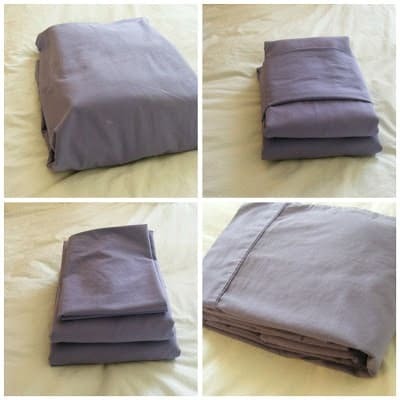 Imperfect Homemaking has an AWESOME tutorial that outlines four different bedsheet bundle folding techniques. So, no matter what kind of look you want for your linen closet, she has a folding technique that will help you achieve it. Next, ward off the mess that results from the youngest child digging through all the piles to find the sheet set that fits her twin bed. Arrange your bedding bundles by size (e.g. twin, full, king). This is especially helpful if your sheet sets all happen to be similar colors. Like the towels, keep a clean look by stacking your bed linens with the fold facing forward (the rounded edge). If you have space, try to create one stack for each size (twin, full, king). Most of us store more than sheets and towels in our linen closets. Here’s what to do with some of the other items you might be storing in there. Unless these are items you rotate to the beds on a frequent basis, these items should be stored on the top shelf of your linen closet. This frees up easier access shelves for items that are used more frequently. If you have young children, you won’t want to store these items on the floor of the closet or on a low shelf. Ideally, you’ll designate a shelf out of their reach. Whether or not you have young kids, I recommend using baskets or bins that are not transparent to store these items. It’s less unsightly than looking at a collection of spray bottles and tubes. Plus, if you have young children, it camouflages these items and reduce the risk of piquing their curiosity. If you store these items in your linen closet, they are good choices for the bottom shelf. You can keep them in a bin or basket, but they also don’t add a cluttered look if they are left out. Like cleaning supplies and hygiene supplies, these can be dangerous to small children. If you keep them in your linen closet, try to keep them out of sight and out of reach. Use bins or baskets to keep them contained and to keep your closet from looking cluttered. Don’t Forget the Closet Door! I am a HUGE fan of using over-the-door shoe organizers to contain clutter throughout my house. I hang them on the inside of closet and cabinet doors. The linen closet is a great place for one of these organizers. They can be used to hold medicine, soap, toothpaste, bandages, washcloths, etc. The linen closet door is also a good spot to store your ironing board. Rumor has it that some of you over-achievers iron your sheets. I’m a laundry underachiever so my ironing board is collecting dust on the back of my master bedroom closet door, presumably ready for me to use it to iron a dress I might wear in the next year or two. Okay, now that I’ve explained my system, you should be able to make sense of my checklist. Feel free to print it and check off items as you get things done.